Washington, Jan 31 (IANS) US President Donald Trump has fired Acting Attorney General Sally Yates after she called the travel ban enforced on seven Muslim-majority nations “unlawful”, a White House statement said. 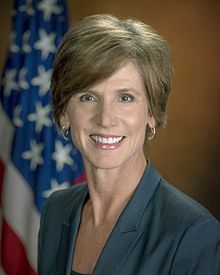 The release said Yates was “relieved of her duties” and “Dana Boente, US Attorney for the Eastern District of Virginia, would “serve as Acting Attorney General until Senator Jeff Sessions is finally confirmed by the Senate”. Yates was slammed as “an Obama administration appointee who is weak on borders and very weak on illegal immigration”. On January 27, Trump put out a four-month hold on allowing refugees into the US and temporarily barred travellers from Iran, Iraq, Syria, Sudan, Libya, Yemen and Somalia, saying the moves would help protect Americans from terrorist attacks. Yates ordered the justice department not to enforce the travel ban.